TMJ refers to the temporomandibular joint. You can identify this area by placing your fingers on your jaw line in front of your earlobes. When you open and close your jaw you will feel the movement of the temporomandibular joints. The temporomandibular joints (TMJ) are the joints which allow us to talk, chew and yawn. These flexible joints connect the mandible (lower jaw bone), to the temporal bone on the side of the skull, in front of and just below the ear. The position and movement of these joints are controlled by muscles that are attached to and surround the joints. A complex joint, muscles of the TMJ allow your jaw to move up and down, side to side and forward and back. 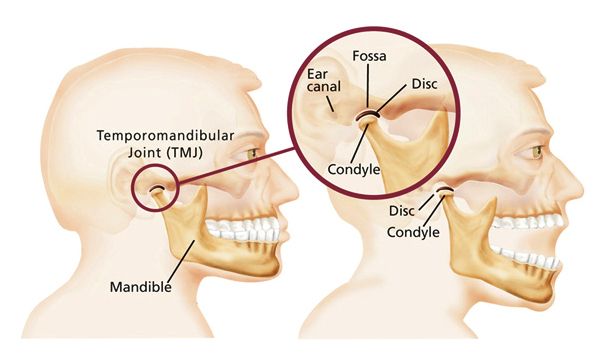 Temporomandibular Joint Dysfunction (TMD) is the term given to a number of symptoms which occur when the jaw joints and the associated muscles are disrupted. Temporomandibular joint disorder is known as TMJ or TMD and refers to pain and dysfunction of the muscles that move the jaw. TMJ usually affects people between twenty and forty years of age. It is more common in females, but one in ten people can have symptoms at some time in their life. Although the condition is not life threatening, it can affect the quality of life for sufferers if symptoms become chronic.